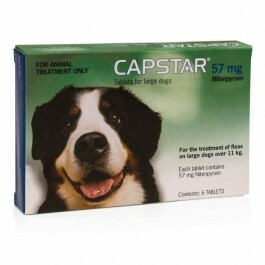 One CAPSTAR 57 mg tablet should be given to dogs weighing 11.1 kg to 57.0 kg and two tablets for dogs weighing over 57 kg when a flea infestation is detected. Do not use on dogs weighing less than 11 kg. For the first hour after administration, the pet may scratch more than normal. This effect is caused by the fleas reacting to the product.